The prime time for travel to Asheville is in the autumn, when the fall foliage explodes with color, often in October. Fall weather in Asheville is generally mild, with October being the driest month and offering average low and high temperatures of 43 °F and 67 °F, respectively. The Asheville Regional Airport (AVL) serves approximately 750,000 passengers per year. 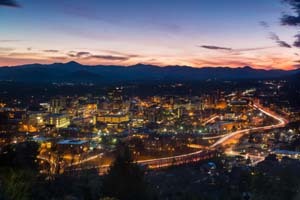 According to a recently released study by MIT' s International Center for Transportation, Asheville Regional Airport is the best connected non-hub airport in the United States. Greenville Spartanburg, Greenville, SC (GSP) - 77 mi. Charlotte Douglas Intl, Charlotte, NC (CLT) - 125 mi. 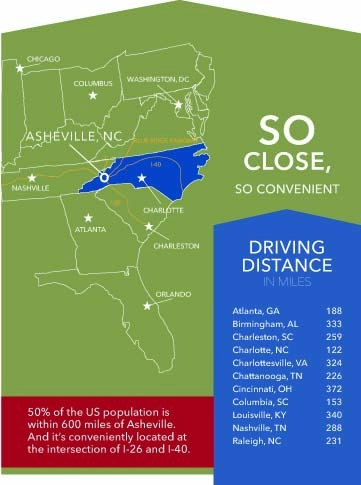 Asheville is conveniently located at the intersections of I-26 and I-40, and is easily accessible via the scenic Blue Ridge Parkway.